Flowering plants naturally know when they need to spare or perish their cells. In a new study reported in Cell, an international group of plant biologists at ITbM, Nagoya University and other research institutes, have examined the ovules of plant cells by live-imaging to reveal a novel cell-elimination system based on an unusual cell fusion. This uncovers the mechanism on how flowering plants prevent further attraction of multiple pollen tubes after successful fertilization. Dr. Daisuke Maruyama and Professor Tetsuya Higashiyama at the Institute of Transformative Bio-Molecules (ITbM) of Nagoya University and the JST-ERATO Higashiyama Live-Holonics Project along with their international team have shown by live-cell imaging techniques that flowering plants, such as Arabidopsis thaliana undergo a cell to cell fusion to prevent the attraction of the second pollen tube after fertilization has occurred. Cell to cell fusion is known to be extremely rare in plant cells due to the presence of the relatively tough cell wall. Only two other examples of plant cell fusion have been observed so far, and over 110 years have passed since the identification of the two cell fusions, which occurred between two sets of gametes during fertilization. 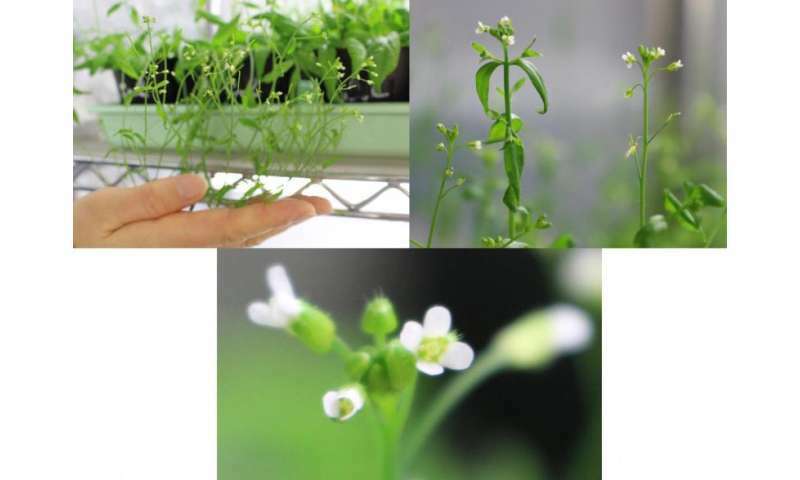 Consequently, this research reports the third plant cell fusion event that was identified during normal developmental processes of flowering plants. The study, published online on April 23, 2015 in the journal Cell, outlines the complicated mechanism of communication between plant cells, where an unusual cell fusion induces selective elimination of the cell responsible for pollen tube attraction after successful fertilization. This research reveals a new type of cell fusion that is initiated to destroy a particular cell, and enlightens the evolution of sexual reproduction in flowering plants. Sexual reproduction in flowering plants occurs by fertilization of the female gamete (a reproductive cell) by a male gamete. Upon successful pollination on the stigma, the pollen tube grows down through the pistil towards the ovary. The mature ovule in most flowering plants, including Arabidopsis thaliana, contains a seven-celled embryo sac consisting of two synergid cells, one egg cell, one central cell and three antipodal cells. The pair of synergid cells are located adjacent to the egg cell and Higashiyama's group have reported in 2001 that the synergid cells are necessary for attracting the pollen tube towards the ovule. The pollen tube enters the ovule through an opening called the micropyle. 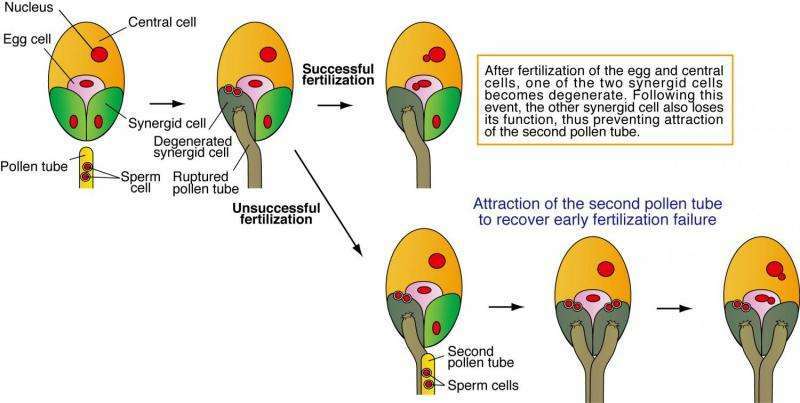 Flowering plants undergo double fertilization by penetration of the pollen tube through one of the synergid cells (degenerated synergid cell), followed by rupture of the pollen tube to discharge the two sperm cells into the embryo sac. The two sperm cells independently fertilize the egg cell and the central cell to produce the embryo and the endosperm (a tissue that surrounds and nourishes the embryo), respectively, which eventually develops into a seed. Once fertilization has occurred, the second synergid cell (persistent synergid cell) degenerated within a few hours of successful fertilization. As a result, additional pollen tubes no longer approach the fertilized ovary, a mechanism termed as 'polytubey block' (polytubey = a condition where an ovule receives multiple pollen tubes). On the other hand, in the event of unsuccessful fertilization, the second synergid cell persists and attracts a second pollen tube to recover the failure of earlier fertilization. "Although the role of synergid cells has been identified, we did not exactly know how the persistent synergid cell is degenerated and induces the polytubey block mechanism upon successful fertilization," says Daisuke Maruyama, an Assistant Professor at Nagoya University who is the first author and leader of this research. "Through examination of Arabidopsis ovules by highly sensitive live-imaging, we were able to see that successful fertilization of the two female gametes triggers an unprecedented cell fusion between the persistent synergid cell and the endosperm (SE fusion), which eventually leads to inactivation of the persistent synergid cell." SE fusion, which is induced by fertilization of the central cell, causes rapid dilution of the pre-secreted pollen tube attractant in the persistent synergid cell. Transmission electron microscopy of the unfertilized ovule revealed a very thin cell wall between the synergid cell and central cell wall, which was assumed to be necessary for rapid disintegration of the cell walls. 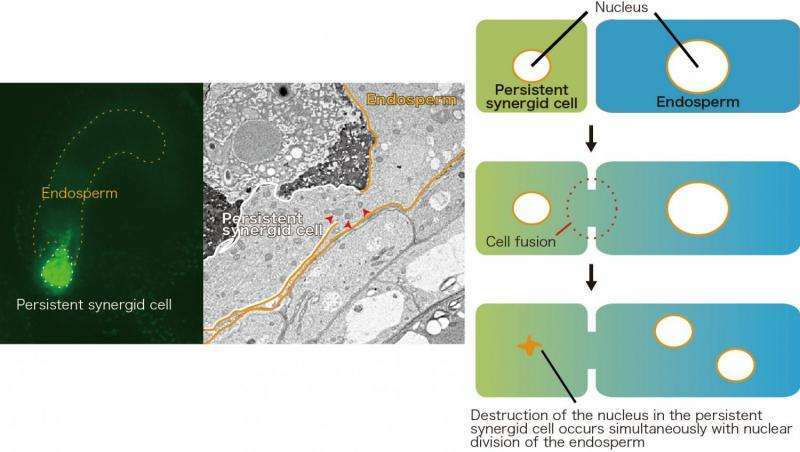 The SE fusion appeared to control the elimination of the persistent synergid nucleus, as disorganization of the nucleus synchronized with proliferation of the endosperm after SE fusion. A continuous cytoplasm between the persistent synergid cell and the endosperm was also observed, providing evidence for fusion of the two cells. On the other hand, fertilization of the egg cell strongly activates ethylene signaling, which also induces selective disorganization of the nucleus in the persistent synergid cell. Thus, the persistent synergid cell completely loses its pollen tube attracting function by synergetic SE fusion and ethylene signaling. "We were extremely excited when we saw that cell fusion occurs between the persistent synergid cell and the endosperm, as the idea of cell fusion is not very common in plant cells," says Maruyama, who made this discovery in 2012. "We continued to look into this phenomena to gain mechanistic insight and found evidence of a unique three-step mechanism for polytubey block, where the egg cell and the central cell coordinately play key roles in eliminating the persistent synergid cell by cell fusion and subsequent nuclear disorganization." Maruyama and Higashiyama's investigation solves the mystery of the sophisticated switch-off mechanism for further fertilization (attraction of multiple pollen tubes) upon successful fertilization in flowering plants. Double fertilization of the female gametes triggers an unusual cell fusion, followed by specific cell disorganization that inactivates the cell responsible for attracting pollen tubes. Interestingly, flowering plants are also able to cancel this polytubey block mechanism when fertilization from the first pollen tube is fruitless. As a result, this enables attraction of the second pollen tube and restores the chance of fertilization. "We have succeeded in perceiving a unique cell fusion mechanism that arises from initial fertilization in flowering plant cells," says Maruyama. "We believe that the discovery of this work sheds light on elucidating cell fusion events and further understanding of the fertilization mechanism in plants. This may lead to the development of new ways to improve the success rate of fertilization in plants, which may have useful applications in agricultural production."